The Britannia Coin series from the Royal Mint is an international symbol of precious metal investment from the United Kingdom. Introduced in gold in 1987 and a decade later as a silver coin in 1997, 2017 marks a significant milestone for this beloved coin program. 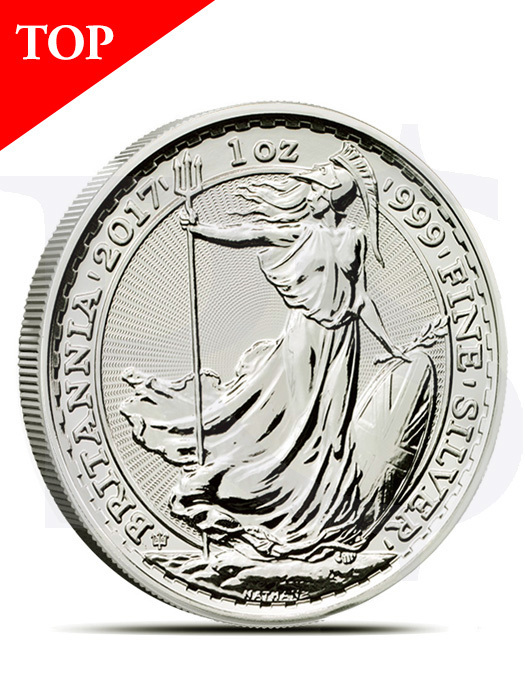 Each of the 2017 British Silver Britannia coins in this listing is in BU condition. Coins in this condition exhibit no signs of wear and tear, though you may notice a range of minor flaws including breaks in the luster, spotted surfaces, and contact marks from the coining process. The Silver Britannia marks its 20th anniversary in 2017, and the Royal Mint is celebrating its most popular coin program in style. These new anniversary releases of the Silver Britannia include a high-security radial sunburst design in the background field to thwart counterfeiting attempts. Britannia serves as the embodiment of the British people, and has been a symbol of the nation for more than 2,000 years. Although she is often viewed as a mythical being, there are those who use her imagery today as a symbol of the powerful women who have ruled over Britain throughout the ages. 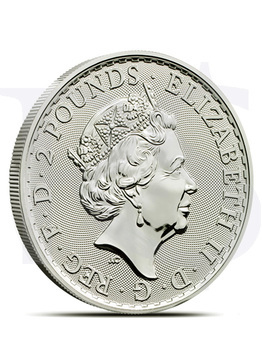 On the obverse of the 2017 1 oz British Silver Britannia Coin is the image of Queen Elizabeth II. This design is the latest portrait of Her Majesty, and serves as the fifth-generation depiction of the Queen since her ascension to the throne in 1952. It was created in July 2015 by Jody Clark, who at 33 years old is the youngest Royal Mint engraver to ever create the Queen’s effigy for coinage. The reverse includes Philip Nathan’s depiction of the strong, powerful Britannia. This female figure wears a Corinthian cap on her head, holds a trident in her right hand as a symbol of her control over the seas, and clutches a shield in her left that is emblazoned with the Union Jack to defend the British Isles from invaders. Also included on the reverse side of the Silver Britannia this year is a small mint mark that celebrates the 20th anniversary of the silver coin. Located to the bottom-left, it is a trident head with a “2” and “0” between the spikes of the trident. Reverse: Features the internationally recognized figure of Britannia standing firm against a powerful gale. Her image has symbolized Britain’s strength and integrity on coinage since Roman times. Features a radial sunburst design that adds anti-counterfeiting protection to your investment. Unique trident mintmark displays "20" between the prongs of the trident.